There was a big surprise at last weekend's MBS Anime Fes event when the scheduled Attack on Titan, Macross Frontier, Gundam SEED, Tiger & Bunny and Haikyuu!! content was supplemented by a set of Sengoku Basara stage performances paying tribute to Production I.G. 's popular anime adaptation. Nakai Kazuya joined his Sengoku Basara co-stars Hoshi Souichirou and Ishida Akira as a secret guest and the three of them performed some live dialogue readings on stage (Hoshi and Ishida were among a number of seiyuu from the series who were already at the event to promote their roles in other shows). T.M.Revolution even returned to the stage to perform FLAGS and SWORD SUMMIT for a delighted audience. I wish I could have been watching! 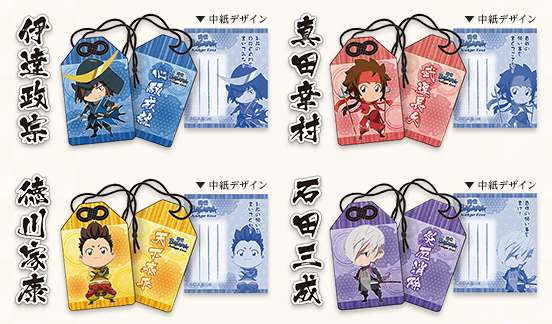 The series might not be selling very well but that isn't stopping companies producing an endless stream of merchandise for it, and the latest update to NTV's Judge End website reveals another batch of goodies to tempt fans to part with more of their cash. Each set comes with three punch-out bookmarks; the small pictures show how they look when you first open the pack. They contain slips of paper so that you can hide your wishes inside them. It's been a while since the existence of the 'Micro Yamaguchi' Revolmini version of Mitsunari was first revealed back in August, but it seems as though he's finally on the way! The official Revolmini Twitter account has tweeted a few pictures which clearly show Mitsunari's silhouette and armour, promising that reservations will open on 25th October 2014. Given how popular the original Revoltech version of Mitsunari seemed to be, it's probably a good idea to preorder early if you want to obtain this smaller version. It doesn't show much, but it's exciting that they're putting this much effort into it! You can see the short trailer here on YouTube or watch below.